Mikuriya is head of the research center where the Kirihara brothers were raised. Naoto holds strong resentment toward Mikuriya for taking Naoya and him from their parents and keeping them captive. 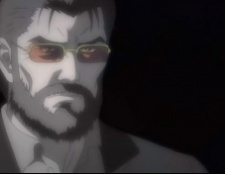 However, the brothers maintain contact with Mikuriya following their escape, and come to his aid in episode 14. Mikuriya considers himself the guardian and protector of the brothers during their 15 years at the research center.